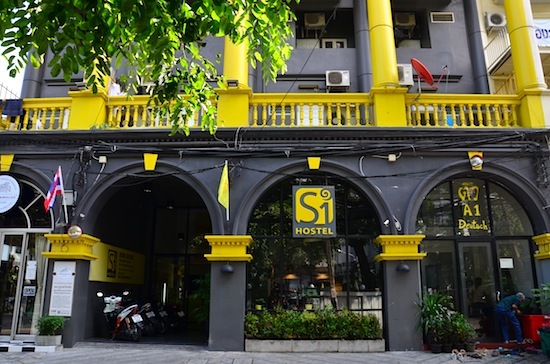 S1 Hostel’s bright yellow-and-grey frontage is hard to miss in the old backpacker hood around Soi Ngam Duphli. 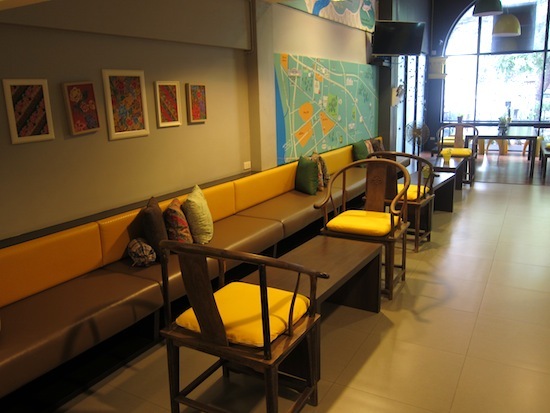 Converted from an old guesthouse and opened after extensive renovations in 2013, S1 is a flashy, modern and comfortable choice for those who aren’t particularly looking for an in-house social scene. Ad Book now! Rates from US$27++. Average rating 8.2 from 271 reviews. It sure does catch the eye. Bright yellow might sound cheesy or tacky, but the hostel pulls off a rather sleek industrial design by contrasting the blazing fluorescence with dark greys, polished concrete, high ceilings, lots of natural light, contemporary art and Thai antiques that somehow fit into the decorative mix. On our most recent visit, an enthusiastic young receptionist patiently showed us four out of the six different room types. A spacious ground-floor common area features a TV and long cushioned bench to go with a free computer station, a kitchenette, local maps and a book exchange. We especially dig the massive wooden table placed up front next to an equally wide window. The stairwell to guest rooms, laundry facilities and a rooftop terrace are all reachable by key-card only. The whole building is air-conditioned and WiFi is free. A lot more space than at many Silom area hostels. In a corner of the upper floor, six-bed mixed and women-only dorms aren’t exactly cosy, but they are spacious and clean. While mattresses are firm and bunks lack privacy curtains, each comes with private reading lamp, electrical outlet and locker. Shared hot-water bathrooms are attached to each dorm room — a convenient feature that ensures you won’t need to wander down a dark hallway in your jammies. Private rooms are divided into two classes: renovated and basic. All come with air-con and fridge, and all but the cheapest bag you a TV. The basic, non-renovated versions come with white-tile floors, blank walls and notably firm beds — reasonable value but a definite step down from the similarly priced rooms at nearby Penguin House. An extra two or three hundred baht lifts you to a renovated room with newer appliances and an industrial-chic design. Bathrooms are on the small side, with sinks situated out within sight of the beds in some rooms. An inspirational (?) message in one of the renovated rooms. All rooms are accessed only by stairs, so ask for one on a lower floor if you’re not up for playing StairMaster. Some rooms, including a few of the cheaper varieties, are also equipped with attached mini-balconies. S1 is located at the corner of Soi Ngam Duphli and Sathorn Soi 1 (hence the hostel’s name), two narrow roads that get their share of traffic. Ask for a room towards the back of this deceptively large building if you’re a light sleeper. Inspirational (?) orange accents in one of the non-renovated rooms. Though you might meet other travellers on the rooftop or in the downstairs lounge, S1 has more of a “keep-to-yourself” vibe. In fact, it always appears to be empty whenever we stop by. Considering how it offers a good mix of rooms and common facilities along with a generally helpful staff, we have trouble figuring out why that is. As for location, well, it’s Soi Ngam Duphli. This narrow side street tucked between Rama IV and Sathorn roads once rivalled Khao San Road for the title of Bangkok’s go-to backpacker district. It’s now a rather tired stretch of old flophouses, bars and hotels, though the location is fairly convenient to Lumpini MRT station, Lumpini Park and the greater Silom area. Check out Lee Travel Inn or Madam Guesthouse for a cheaper private room in this neck of the city. If you’re specifically looking for a dorm, you might want to check out other options in the Silom area, like Saphai Pae, Lub d, Cooper, Mile Map, HQ and The Cube. Non-renovated room, up to 800 baht for larger room with TV. 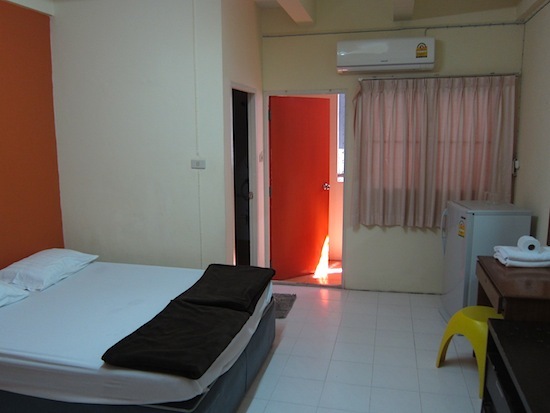 Room: Dbl air-con private bathroom, low season: 600 baht, high season 600 baht. Notes: Non-renovated room, up to 800 baht for larger room with TV. Where are you planning on heading to after Silom? Here are some spots commonly visited from here, or click here to see a full destination list for Thailand.